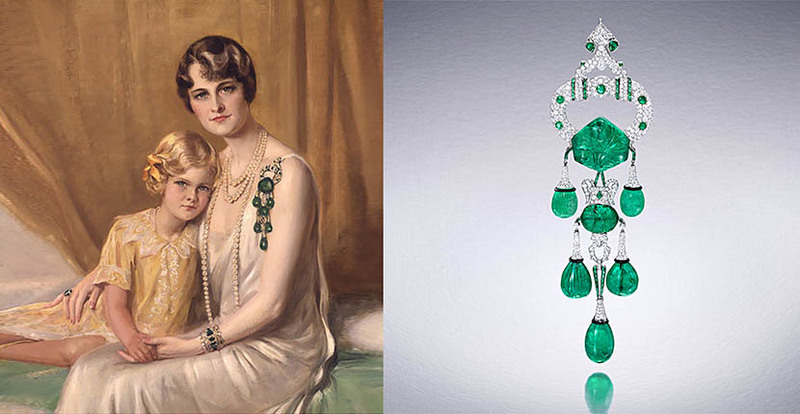 Marjorie Merriweather Post, in a portrait with her daughter, wearing a carved emerald, diamond and platinum brooch made by Cartier in the 1920s. Photo Getty and the Hillwood Estate, Museum & Gardens. There once was a time, about 100 years ago, when a 27-year-old American woman became one of the richest people in the nation. Marjorie Merriweather Post inherited her father’s fortune from the Post cereal company when he passed away in 1914. So, what did she do with that money? Well, her name has resurfaced in the national news of late as the original owner of Mar-a-Lago. The lavish Palm Beach, Florida home, she and her second husband Edward F. Hutton had built in the 1920s. Merriweather Post bequeathed the mansion to the National Park Service upon her death but the upkeep was too high for the government to properly maintain it. Mar-a-Lago went back on the market in the 1980s and, well, we all know who bought it. Merriweather Post also spent a king’s ransom on jewelry. Over her lifetime she acquired more than 200 grand pieces. 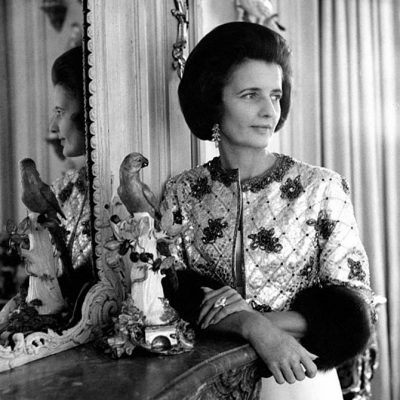 Her collection was one of the finest ever put together by an American woman. It was in the stratosphere level of collecting, on a par with Elizabeth Taylor or the Duchess of Windsor. Several of her magnificent jewels by twentieth century masters have been seen in books and exhibitions over the years. 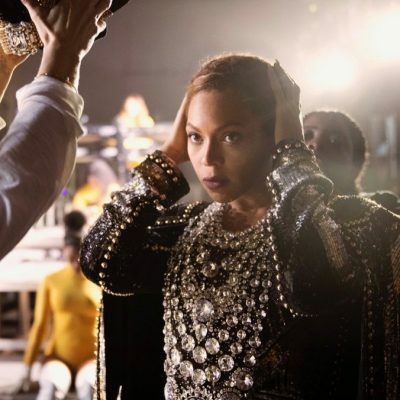 She donated a handful of exceptional jewels to the Smithsonian in Washington including the 21.04-carat Maximilian Emerald in a Cartier ring, the Marie Antoinette Diamond Earrings, the Blue Heart and an astonishing emerald art deco Indian inspired necklace by Cartier referred to as the Post Emerald Necklace. 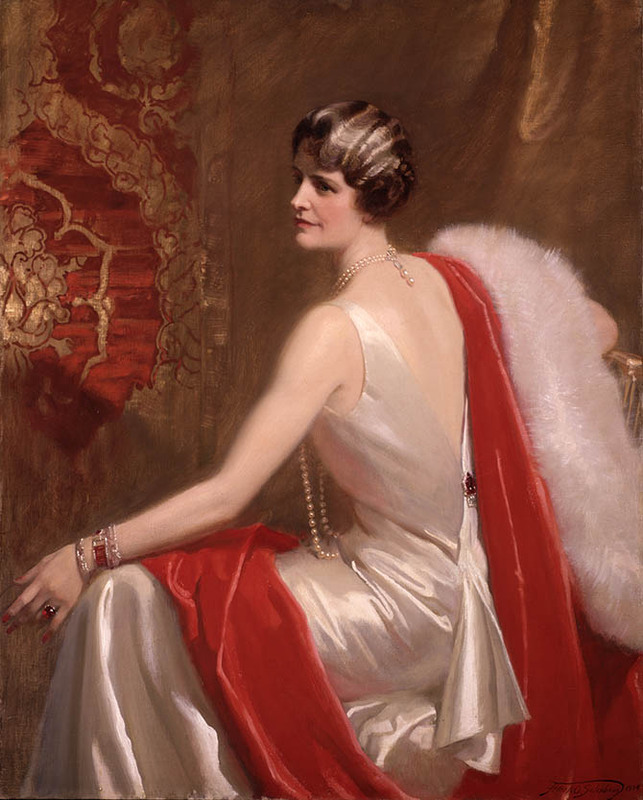 Some pieces were sold at auction in the 1980s to raise funds for her former home that is now a museum, the Hillwood Estate, Museum & Gardens in Washington, D.C.
A portrait of Marjorie Post painted by Frank O. Salisbury in 1934 during the period when she was married to E. F. Hutton. She is wearing two ruby and diamond bracelets by Cartier as well as other assorted jewels. Photo courtesy of the Hillwood Estate, Museum & Gardens. 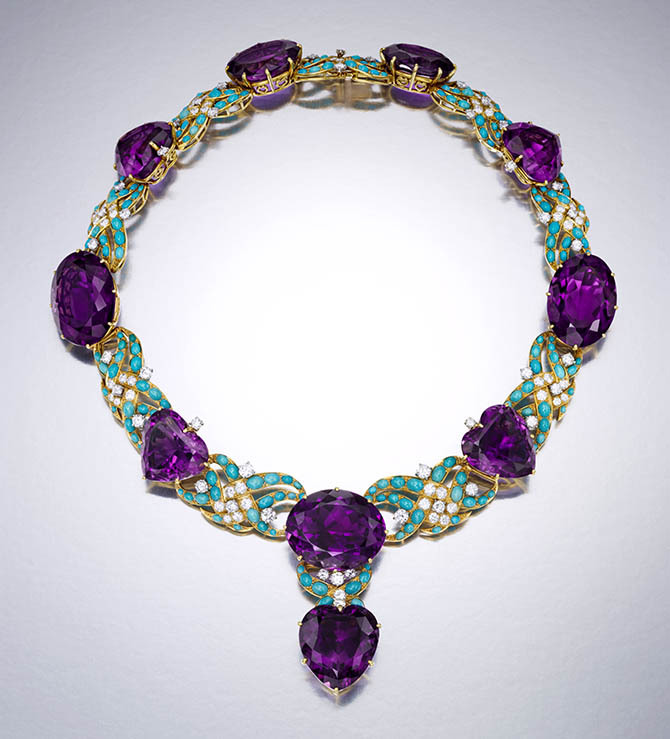 The vast majority of Merriweather Post’s jewelry is in the Hillwood Museum collection. 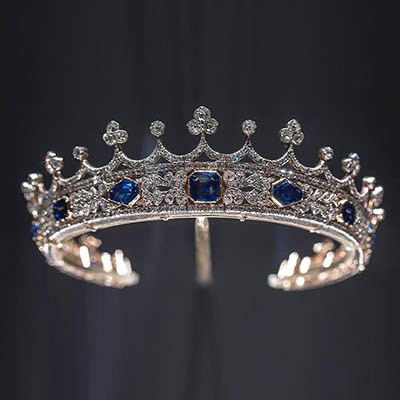 For the first time ever, Hillwood has put 50 of the best jewels on display until January 1, 2018 in an exhibition titled Spectacular: Gems and Jewelry from the Merriweather Post Collection. Portrait of Marjorie Post painted by Frank O. Salisbury in 1946 during the period she was married to Joseph E. Davies. 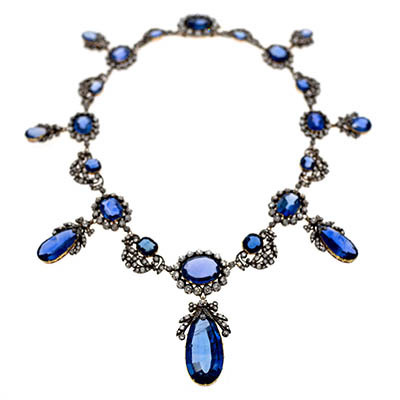 Detail the sapphire, diamond and platinum fringe necklace Post is wearing. It was commissioned from Cartier in 1937. Photo courtesy of the Hillwood Estate, Museum & Gardens. When the economy was booming in the roaring twenties, she acquired contemporary and historic masterpieces from Pierre Cartier. In the 1930s during the Depression, she locked away her jewelry at the bank and gave the money she saved on insurance to the Marjorie Post Hutton Canteen that fed underprivileged women and children in a homey environment in New York City. During the 1960s, as she began the process of donating jewelry to the Smithsonian, one day she brought over treasures in a simple shopping bag. She also wrote letters to her friends on behalf of the Smithsonian in an effort to get them to give some jewels to the national institution. 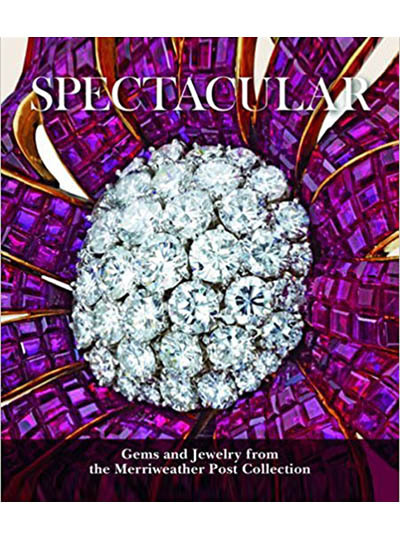 Other sections of the book include essays by several experts covering the background of the designs, in depth stories on the gems and the historical context in which the antiques were made. There are paintings of Merriweather Post in her jewels, some rarely seen photos from the 1920s. There is also a great portrait by Irving Penn of Merriweather Post in her Verdura “Diana” bracelet taken by Irving Penn for the August 15, 1951 issue of Vogue. Original designs of the jewels in the collection and other fascinating ephemera appear throughout the publication. The book is well written and beautifully illustrated. I feel certain Mrs. Merriweather Post who had such a great sense of noblesse oblige would be delighted her treasures were being shared with the public in a beautiful and educational manner. What she would think about the current goings on at Mar-a-Lago is harder to say. 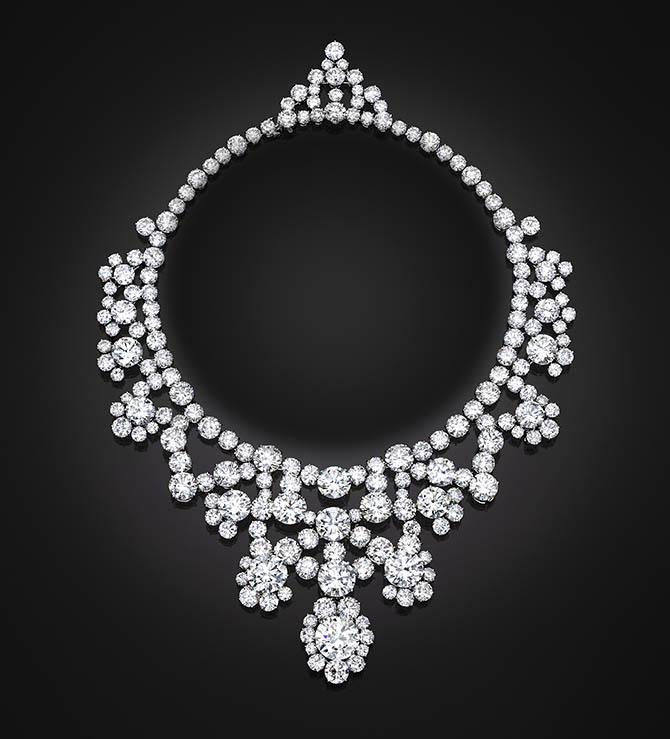 A diamond and platinum bib necklace by Harry Winston made around 1965. Photo courtesy of the Hillwood Estate, Museum & Gardens. 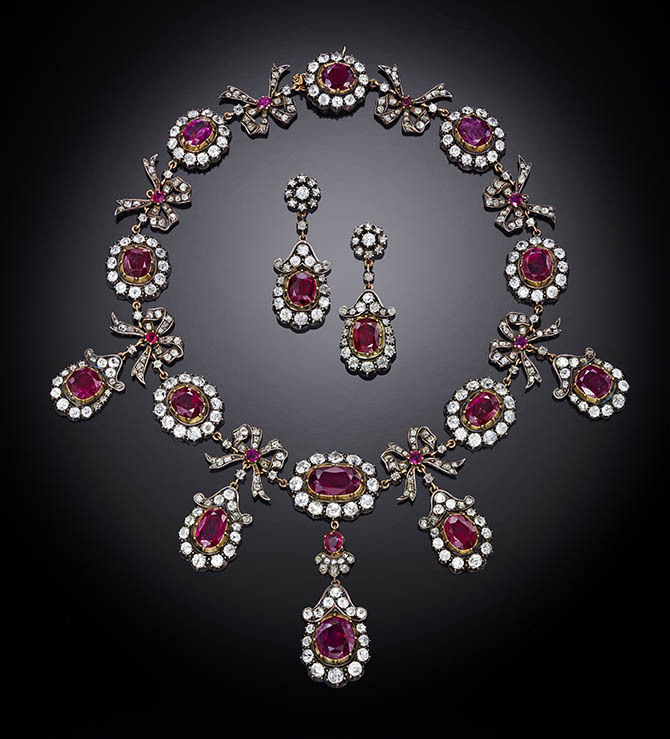 Ruby, diamond, silver, and gold earrings and necklace probably made in France during the first quarter of the 19th century. Photo courtesy of the Hillwood Estate, Museum & Gardens. 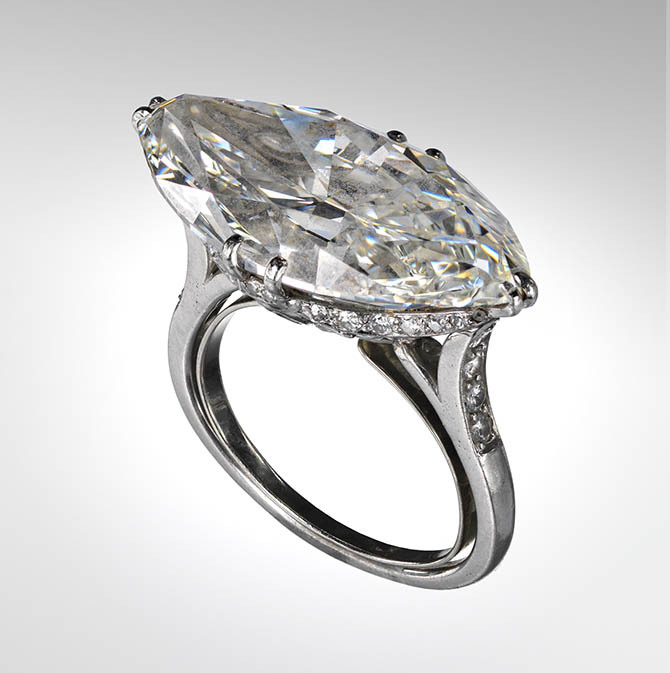 The 17.15-carat east west set marquise diamond engagement ring Herbert May presented to Marjorie Post in 1958. The jewel was designed by Harry A. Meyers of New York. Photo courtesy of the Hillwood Estate, Museum & Gardens. 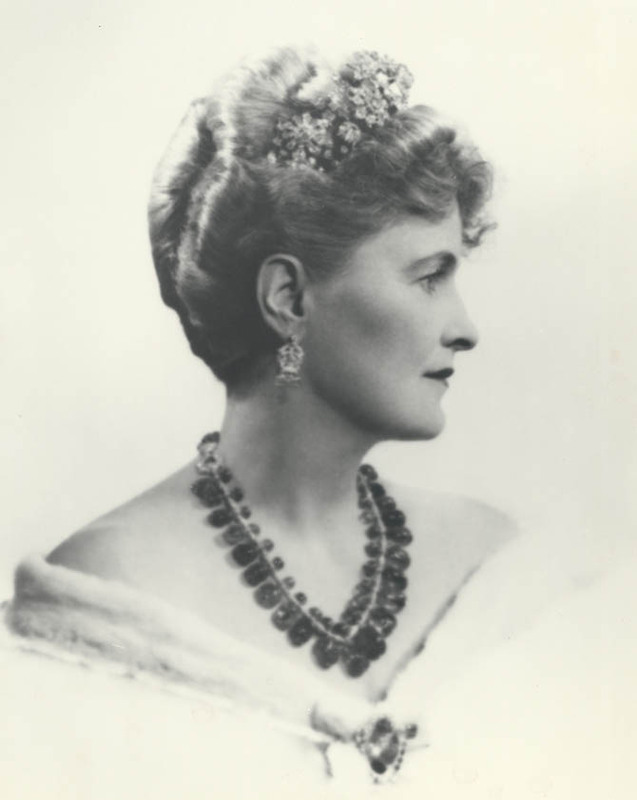 Marjorie Post wearing her Cartier emerald and diamond necklace she bequeathed to the Smithsonian with an antique tiara and earrings by Van Cleef & Arpels. Photo courtesy of the Hillwood Estate, Museum & Gardens.